Q1. What is ITC's Vision and Mission? Sustain ITC's position as one of India's most valuable and admired corporations through world-class performance, creating growing value for the Indian economy and the Company's stakeholders. To enhance the wealth generating capability of the enterprise in a globalising environment, delivering superior and sustainable stakeholder value. Q2. How does the Company effectively manage a highly diversified business portfolio? What is the Company's Corporate Governance structure? Answer: ITC's 'Strategy of Organisation' is crafted in a manner that enables focus on each business while harnessing the diversity of the portfolio to create unique sources of competitive advantage. Please refer to the following link https://www.itcportal.com/about-itc/values/index.aspx#sectionb4 for details of ITC's Governance Structure. Q3. What is the Company's shareholder value creation track record? Answer: ITC has been a consistent performer in terms of shareholder value creation. 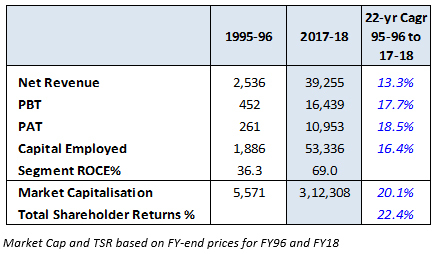 During the period 1995-96 to 2017-18, Total Shareholder Returns have clocked compound annual growth rate of 22.4% significantly outperforming the Sensex (10.9%). Q4. Please provide a brief overview of Q3 FY19 results. Answer: Gross Revenue for the quarter stood at Rs. 11340.15 crores, representing a growth of 15.1% driven mainly by FMCG-Others, Agri Business and Paperboards, Paper & Packaging. Profit after Tax before considering exceptional items, grew by 13.8% - a 17-quarter high. Total Comprehensive Income stood at Rs. 3637.01 crores (previous year Rs. 3177.06 crores). Q5. (a). Why has 'Consumption of Raw Material etc. (net)' increased by Rs. 704.04 Crores during Q3 FY19 as compared to Q3 FY18? Answer: Increase in Consumption of Ram Material is mainly due to higher share of agri business in sales. On a comparable basis, adjusting for the higher share of agri business, the increase in cost is in line with growth in revenue. Q5. (b). Why has 'Other Expenditure' increased by about Rs. 280.74 Crores from Rs. 1691.47 Crores in Q3 FY18 to Rs. 1972.21 Crores in Q3 FY19? Answer: Increase in Other Expenditure is mainly attributable to higher freight expenses mainly on account of agri business coupled with increase in fuel costs and increase in operating expenditure on account of new facilities. Q5. (c). What is the growth in FMCG - Others - Segment EBITDA in Q3 FY19 as compared to Q3 FY18? Answer: In respect of FMCG-Others segment, earnings before interest, taxes, depreciation and amortization (EBITDA), for Q3 FY19 is at Rs. 173.38 Crores Vis a Vis Rs. 122.44 Crores for Q3 FY18, a growth of 41.6%. Q6. Please provide an overview of the Company's progress in the new FMCG businesses. What is the Company's goal in the new FMCG businesses? Answer: The FMCG industry faced another challenging year in 2017-18 with demand conditions remaining sluggish for the fifth year in a row. The slowdown in the broader economy, as reflected by the marked deceleration in nominal GDP and private consumption expenditure growth, headwinds in rural demand and supply chain disruptions during the transition to the GST regime were manifest in the Company's operating segments in the FMCG space. The year also witnessed commodity prices settling at an elevated level, exerting pressure on margins. While it is anticipated that the FMCG industry will take a few more quarters for demand revival to play out fully, the green shoots of economic recovery and expectations of normal monsoons augur well for the industry. The structural drivers of long-term growth such as increasing affluence and consumer awareness, a young and expanding workforce, increasing urbanisation, Government's thrust on infrastructure development and the rural sector, implementation of GST amongst others, remain firmly in place and the FMCG industry is poised for rapid growth in the ensuing years. Despite the challenging conditions prevailing in 2017-18, the Company's FMCG-Others Businesses' Segment Revenue at Rs. 11329 Crores grew ahead of industry and recorded an increase of 11.3% (on a comparable basis) on a relatively firm base. While the second half of 2016-17 witnessed reduced consumer offtake and trade pipelines in the wake of adverse liquidity conditions, the Company's FMCG-Others Businesses were relatively less impacted. Most major categories enhanced their market standing during the year. While 'Bingo!' snacks, 'Aashirvaad' atta and 'Dark Fantasy Choco Fills' premium cream biscuits were the key drivers of growth in the Branded Packaged Foods Businesses, 'Engage' deodorants, liquid wash & shower gels and 'Savlon' handwash fuelled strong growth in the Personal Care Products Business. The Education and Stationery Products Business posted a robust performance in FY 17-18 led by 'Classmate' notebooks, which consolidated its leadership position in the industry. However, the performance of the Lifestyle Retailing Business remained sluggish mainly on account of an early and prolonged 'end-of-season' sale in the wake of disruption to the trade during transition to GST and ongoing structural interventions to enhance operating efficiencies. Segment Results for the year 2017-18 improved to Rs. 164 Crores from Rs. 28 Crores in 2016-17 driven by enhanced scale, product mix enrichment and strategic cost management initiatives after absorbing the impact of sustained investment in brand building, gestation costs of new categories viz. Juices, Dairy, Chocolates and Coffee and costs associated with the ongoing structural interventions in the Lifestyle Retailing Business. The Company continued to make investments during the year towards enhancing brand salience and consumer connect while simultaneously implementing strategic cost management measures across the value chain. Several initiatives were also implemented during the year towards leveraging the rapidly growing e-commerce channel with a view to enhancing the reach of Company's products and harnessing digital and social media platforms for deeper consumer engagement. In FY 17-18, the Company commissioned two world-class Integrated Consumer Goods Manufacturing and Logistics Units (ICMLs) at Panchla, West Bengal and Kapurthala, Punjab. Significant progress was also made in constructing several other state-of-the-art owned ICMLs across the country to secure capacity and enable the FMCG Businesses to rapidly scale up in line with long-term demand forecast. Currently, over 15 projects are underway and in various stages of development – from land acquisition/site development to construction of buildings and other infrastructure. The Businesses are focussing on deploying 'Industry 4.0' technologies including advanced analytics, big data and industrial Internet of Things (IoT) in areas such as overall equipment efficiency, energy management, maintenance, downtime analysis, quality and traceability. The FMCG Businesses mainly comprising Branded Packaged Foods, Personal Care Products, Education and Stationery Products, Incense Sticks (Agarbattis) and Safety Matches have grown at an impressive pace over the past several years. Today, the Company's vibrant portfolio of brands represents an annual consumer spend of nearly Rs. 16000 Crores in aggregate. These brands have been built organically over a relatively short period of time - a feat unparalleled in the Indian FMCG industry. In terms of annual consumer spend, 'Aashirvaad' is today over Rs. 4000 Crores; 'Sunfeast' over Rs. 3500 Crores; 'Bingo!' over Rs. 2000 Crores; 'Classmate' & 'YiPPee!' are over Rs. 1000 Crores each and 'Vivel', 'Mangaldeep' & 'Candyman' are over Rs. 500 Crores each. These world-class Indian brands support the competitiveness of domestic value chains of which they are a part, ensuring creation and retention of value within the country. The Company's FMCG brands have achieved impressive market standing in a relatively short span of time. Today, Aashirvaad is No. 1 in Branded Atta, Bingo! is No. 1 in Bridges segment of Snack Foods (No.2 overall), Sunfeast is No. 1 in the Premium Cream Biscuits segment, Classmate is No. 1 in Notebooks, YiPPee! is No. 2 in Noodles, Engage is No. 2 in Deodorants (No. 1 in women's segment) and Mangaldeep is No. 2 in Agarbattis (No. 1 in Dhoop segment). The Company remains agile and responsive to the emerging trends shaping the future of the industry. Some of the noteworthy consumer trends include the emergence of health and wellness products as a key consumer need; increasing preference for products rooted to 'Indianness' and with regional/cultural connects; increasing need for customised products and bespoke experiences; growth in demand for 'on-the-go' consumption formats and rising influence of social media and digitalisation on consumer preferences and shopping behaviour. Similarly, the FMCG market construct is likely to undergo rapid change driven by exponential growth in tier - II/III towns and rural India and the emergence of relatively new channels such as Modern Trade and e-commerce. The Indian FMCG market is at an inflection point and the Company seeks to rapidly scale up the FMCG Businesses leveraging its institutional strengths viz. deep consumer insight, proven brand building capability, agri-commodity sourcing expertise, cuisine knowledge, strong rural linkages, a deep and wide distribution network and packaging know-how. In addition, the Company continues to make significant investments in Research & Development, focus on consumer insight discovery and harness digital technology to develop and launch disruptive and breakthrough products in the market place. Q7. Please provide a revenue split of the FMCG–Others Segment. Answer: The Branded Packaged Foods Businesses represent the largest component of this segment, accounting for ~77% of Segment Revenue. The Personal Care Business and Education and Stationery Products Business account for ~9% and ~7% each of Segment Revenues respectively. Q8. What are the new FMCG categories that the Company is likely to enter over the short to medium term? Answer: With aspirations to become the No.1 FMCG player in India, the Company continuously evaluates opportunities to grow in the FMCG space. The choice of category is guided by its growth prospects, profitability profile and the ability of the Company to effectively leverage its institutional strengths with a view to achieving leadership status within a reasonable time frame. Synergies with existing categories in terms of overlap of distribution reach, brand extension possibility, procurement efficiencies etc. are considered while choosing new categories. The Company is in the process of scaling up its presence in Dairy & Beverages, Chocolates and Coffee. Q9. What is the margin profile of the Branded Packaged Foods Business? Answer: The Branded Packaged Foods Businesses of the Company comprise 'Confections', 'Staples, Snacks and Meals' and 'Dairy & Beverages'. These Businesses have evolved over a period of time and are currently at different stages of their lifecycles. As such, the revenue dimensions, cost structures and profitability profiles of each of these businesses are distinct from the other. For example, EBIT margin is in the high single digit range for the Staples business (first full year of launch: 2002/03) while the same is in the mid-single digit range for the Snack Foods business (first full year of launch: 2007/08) representing upfront investments towards category development and brand building. Overall, each category is striving towards achieving best-in-class margins within a reasonable period of time. Q10. What is the margin profile of the Personal Care Products Business? When will it break-even? Answer: The Personal Care Products Business presently comprises the 'Personal Wash', 'Fragrancing Products', 'Skin Care', 'Antiseptic Liquid' and 'Floor Cleaner' categories. The Company continues to make significant investments in this Business primarily in the area of brand building, R&D and product development towards competing effectively with incumbent players comprising firmly entrenched MNCs and domestic companies. Presently, each category is operating at industry benchmarked gross margins. With enhanced scale and consumer connect, each category is expected to earn best-in-class EBIT margins progressively over the medium-term. Q11. What are the Company's targets in the FMCG–Others space? What does the Company envision in terms of revenue and profits in this segment, over the medium and long-term? Answer: ITC's endeavour is to become the No.1 FMCG player in India driven by the existing portfolio as well as entry into new categories. In this regard, the Company is aiming for revenue of Rs. 100,000 Crores from the new FMCG businesses by the year 2030. Over the medium term, the Company seeks to grow revenues of each category within the FMCG-Others segment at a rate which is well ahead of industry. With enhanced scale and consumer connect, each category is expected to earn best-in-class EBIT margins, progressively over the medium-term. Q12. Would ITC contemplate acquisitions in order to achieve its vision in the Other FMCG segment? Answer: ITC examines prospects for inorganic growth that arise from time to time not only in this business segment but also in the other businesses. The Company continues to evaluate opportunities to grow its businesses through Acquisitions and Joint Ventures and is guided by considerations such as strategic fit, valuation, financial viability, ease of integration etc. The Company's 'Savlon' and 'Shower to Shower' brands, acquired earlier, have been leveraged to strengthen its position in the personal care space by expanding its existing product portfolio and gaining access to newer consumer segments and markets. The offerings have garnered significant consumer franchise and are well poised for rapid growth. 'Charmis' brand acquired by the Company in FY18 has been leveraged to re-launch moisturising skin creams with a fresh look & enhanced sensorial experience supported by a focussed campaign showcasing the brand's core value proposition - 'it is the goodness within that glows on the face'. Earlier during the year, Personal Care Products Business forayed into the floor cleaner segment under the recently acquired 'Nimyle' brand. The range of herbal floor cleaners was extended to new markets even as it recorded robust growth in existing markets. Plans are on the anvil to scale up the brand's presence across target markets. Q13. Please provide an update on the Company's progress in the FMCG-Others Segment during the quarter. Answer: The FMCG-Others Segment posted a steady performance during the quarter with Revenue growing by 11.5% led by Atta, Snacks, Premium cream Biscuits and Noodles in the Branded Packaged Foods Business, Fragrancing Products and Liquids (handwash & bodywash) in the Personal Care Products Business and Classmate Notebooks in the Education & Stationery Products Business. Growth in overall Segment Revenue was partially impacted by the ongoing restructuring of the Lifestyle Retailing Business and structural changes pertaining to the timing of trade promotions in the Matches and Agarbatti Business; underlying growth, adjusting for these was at ~12.7%. In the Staples, Snacks and Meals Business, 'Aashirvaad' atta consolidated its leadership position across markets maintaining its strong growth momentum. Increasing consumer traction, anchored on innovative and differentiated variants, continues to drive growth in the Snacks portfolio led by 'Bingo!' potato chips and Tedhe Medhe. In the Instant Noodles category, product portfolio stood augmented with the launch of YiPPee! 'My' range noodles. Available in four exciting variants, the 'My' range has been crafted keeping in mind the taste preferences of young adults. The products have received encouraging response and are being rolled out to target markets. In the Confections Business, Dark Fantasy Choco Fills continue to witness impressive growth driven by superior product attributes, focused communication, efficient distribution and consumer activation. During the quarter, the Biscuits portfolio stood expanded with the launch of 'Sunfeast' Mom's Magic Choco Chip and two crispy variants of Sunfeast Snacky – “Masala Twist” and “Something Else!”. The Business also launched 'Candyman' Fantastik, a crispy wafer roll filled with luscious choco creme, in the Confectionery segment which has received encouraging response from target consumers. In the Dairy & Beverages Business, product portfolio was augmented with the launch of Sunfeast 'Wonderz Milk' in three exciting formats (Fruit 'n' Milk, Shakes and NutShakes) in select markets. Made with real fruit and badam bits, Sunfeast Wonderz promises to take the consumers on an exciting taste adventure to discover the wonders of milk. The Business also expanded its fresh dairy footprint with the launch of 'Aashirvaad Svasti' milk and dahi in Kolkata. The products are made using highest quality milk procured through a superior sourcing network leveraging the expertise of the Company's Agri Business and processed using a special “Taste-Up” process that makes the milk Richer, Thicker and Tastier. During the quarter, the 'Fabelle' range of chocolates was augmented with the launch of several delectable variants. In the boxed chocolate range, the Business launched Ruby Gianduja - a blended chocolate with rich Turkish hazelnut paste which offers a delightful experience to chocolate enthusiasts and connoisseurs. The luxury chocolate bars range was further strengthened with the launch of Rocky Road, a crunchy chocolate bar filled with nuts, delectable dry fruits and crispy cereals. The quarter also marked the launch of a range of premium chocolate bars, crafted in two unique formats - Centre Filled bars (Fabelle Soft Centres) and Multi Layered bars (Fabelle Choco Deck). Priced in the range of Rs. 65-Rs. 160 per pack, these products are currently available in select retail and modern trade outlets in Bengaluru. The Personal Care Products Business continued to scale up led by fragrancing products, liquids (handwash and bodywash) and the 'Nimyle' range of herbal floor cleaners. In the Fragrancing category, the innovative range of pocket perfumes, designed to drive on-the-go consumption, continued to grow strongly despite intense competitive activity in recent months. The 'Dermafique' range of premium creams, cleansing and toning products, launched in the previous quarter stood expanded with the introduction of two new variants, Acne Avert [Cleansing Mousse] and Night Replenish [Body Serum]. 'Nimyle' recorded robust growth in existing markets in East and was extended to new markets in South. Please refer to the FMCG - Others section in the Report of the Directors & Management Discussion and Analysis for the financial year ended 31st March 2018 and Media Releases on quarterly results for further details. Q14. What is the progress on upcoming integrated consumer goods manufacturing facilities (ICMLs) of the Company? Answer: The Branded Packaged Foods and Personal Care Products Businesses continue to leverage state-of-the-art integrated consumer goods manufacturing facilities (ICML) to service proximal markets in a highly efficient and responsive manner. Over the last two years, ICMLs have been established at Uluberia (West Bengal), Guwahati (Assam), Mysuru (Karnataka), Kapurthala (Punjab) and Panchla (West Bengal), significantly expanding the operational footprint which is being leveraged to scale up the aforestated businesses and provide structural advantages. During the quarter capacity utilisation at ICML Trichy, commissioned in the September'18, was scaled up progressively. Further, the manufacturing capability of ICML Kapurthala was augmented with the commissioning of new state-of-the-art lines for Juices/Milk based beverages. Q15. Please provide an update on the Cigarettes business. Answer: A punitive and discriminatory taxation and regulatory regime continues to exert severe pressure on the domestic legal cigarette industry even as illegal cigarette trade grows unabated. Please refer to the FMCG - Cigarettes section in the Report of the Directors & Management Discussion and Analysis for the financial year ended 31st March 2018 and Media Releases on quarterly results for further details. Q16. What is the Company's view on cigarette volume trends over the medium to long term? Answer: As aforestated, the tax incidence on cigarettes, after cognising for the latest increase in Cess rates, has nearly trebled over the last six years, on a comparable basis. As highlighted earlier, while overall tobacco consumption in the country continues to grow, the share of duty-paid cigarettes has come down substantially over the years and is estimated to account for around 10% of current tobacco consumption in the country. Despite accounting for such a low share of overall tobacco consumption in the country, the legal cigarette industry contributes more than 87% of tax revenue from the tobacco sector. The other types of tobacco products contribute barely 13% of tax revenue from the tobacco sector despite accounting for 90% of total tobacco consumption. 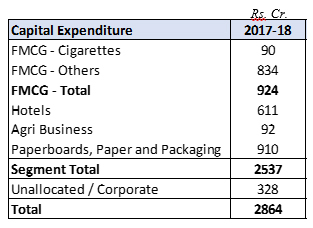 While this indicates room for growth in legal cigarette volumes going forward, this would largely depend on the taxation and regulatory policy on cigarettes adopted by the Government. Such growth potential was demonstrated during the period 2004/05 to 2006/07 and again, more recently, in 2009/10 and 2011/12 – years in which taxes / duties growth were moderate. A stable, fair and equitable India-centric cigarette taxation and regulatory policy which recognises the unique tobacco consumption pattern in the country is critical to realising the full economic potential of the tobacco sector in India. The Company continues to engage with the concerned authorities, both at the Central Government and State level, in this regard. Q17. At what rate are Cigarettes taxed under the GST regime? What is the impact of GST on Cigarettes Business? Answer: Cigarettes are taxed under the GST regime at the peak rate of 28%. Additionally, a GST Compensation Cess which includes an Ad Valorem component and a Specific Tax component based on cigarette length, has also been imposed. The National Calamity Contingent Duty (NCCD) component of Excise Duty continues to be levied as earlier based on the length of the cigarette. Please see response to question no. 16 for impact of GST on Cigarette Business. Q18. What is the impact of the larger graphic health warnings (GHW) on packs on the cigarette industry? Answer: The 85% GHW is excessively large, extremely gruesome and unreasonable. There is no evidence that cigarette smoking would cause the diseases depicted in the pictures or that large GHW will lead to reduction in consumption. The large GHW fuels the growth of smuggled international brands as such cigarette packs do not carry the excessively large (85% of the surface area of both sides of the cigarette package) pictorial warnings with extremely gruesome and unreasonable images that are prescribed under Indian laws. While the legal cigarette industry scrupulously complies with the statutory provisions, smuggled international brands of cigarettes either do not bear any pictorial or other health warnings or bear warnings of much smaller dimensions, that too different from what is mandated under Indian law. Findings from research conducted by IMRB International, an independent organisation, indicate that the lack of warnings or their diminutive size creates a perception in the consumer's mind that the smuggled cigarettes are 'safer' than domestic duty-paid cigarettes that carry the statutory warnings. As stated earlier, new graphic health warnings with even more gruesome images have been introduced from 1st September 2018. It is pertinent to note that the global average size of pictorial warnings is only about 30% coverage of the principal display area. In fact, the three countries that account for about 51% of the world's cigarette consumption, viz., USA, Japan and China have not adopted pictorial / graphical warnings and have prescribed only text-based warnings on cigarette packages. The statutorily prescribed pictorial warning occupying 85% of both sides of a cigarette pack ranks India in the 2nd position globally in terms of their stringency Unfortunately, these laws have fuelled, albeit unintentionally, the growth of illegal cigarettes in the country. The excessively large GHWs prevent consumers from making an informed choice in a competitive market, since they are denied adequate information about the brand on the cigarette packages. The Company believes that such GHW also devalues the Intellectual Property Rights of brand owners and sub-optimises the large investments made over the years in creating and nurturing the brands. Q19. What are the Company's plans in the 'other tobacco and nicotine products' space? Answer: In the year 17-18, the Electronic Vaping Devices portfolio was augmented with the launch of EON Myx, a disposable variant which is offered in adult flavours like coffee in addition to menthol and full flavour. The consumer response to this offering has been encouraging. The rechargeable variant, EON Charge, further strengthened its performance during the year 17-18. Given the nascent state of the market and the evolving regulatory oversight globally, the Company remains engaged with the policy makers for adoption of an appropriate and equitable regulatory framework in India for this category. Q20. Please provide an update on the Company's Hotels business. Answer: The Business recorded a healthy growth in Segment Revenue during the quarter driven by improvement in ARR. Operations at the recently commissioned hotels - ITC Kohenur (commissioned in Q1 FY19) and ITC Grand Goa, Resort & Spa (commissioned in October'18) - were scaled up, receiving excellent reviews from discerning guests and raising the bar of service excellence. The iconic culinary brands of ITC Hotels viz. Dum Pukht, Bukhara, Kebabs & Kurries, Peshawri, Avartana, Ottimo, Royal Vega, continue to delight customers with their delectable offerings. The newer brands - Dum Pukht Begum's, Tempero and Yi Jing have received encouraging response from discerning guests. Please refer to the Hotels section in the Report of the Directors & Management Discussion and Analysis for the financial year ended 31st March 2018 and Media Releases on quarterly results for further details. Q21. Please provide an update on the Company's Agri Business. Answer: Market opportunities in Wheat and Oilseeds along with enhanced focus on value-added portfolio, especially Coffee, Spices and Aqua, resulted in robust growth in revenue during the quarter. However, in the leaf tobacco vertical, subdued demand for leaf tobacco in international markets, relatively steeper depreciation in currencies of competing origins in recent years along with leaf cost escalation pertaining to Andhra 2017 crop continued to weigh on Segment Results. Please refer to the Agri Business section in the Report of the Directors & Management Discussion and Analysis for the financial year ended 31st March 2018 and Media Releases on quarterly results for further details. Q22. Please provide an update on the Company's Paperboards, Paper and Packaging Segment. Answer: Segment Revenue growth of 20.5% was driven by strong demand and capacity augmentation in Value Added Paperboard and Décor segments. Segment Results registered a healthy growth of 23.8% driven by product mix enrichment, higher realisation, strategic investments in imported pulp substitution, process innovation leading to improved pulp yield and benefits of a cost-competitive fibre chain. Please refer to the Paperboards, Paper & Packaging section in the Report of the Directors & Management Discussion and Analysis for the financial year ended 31st March 2018 and Media Releases on quarterly results for further details. Q23. Please provide details of the Company's Capital expenditure by Business. Q24. Please provide an overview of the capex plan of the Company. Answer: The Company's capex plans are directed primarily towards capacity gearing, productivity enhancement, ensuring the highest standards in quality and environment, health & safety, and R&D. One of the key elements of the capex plan going forward is to invest in setting up state-of-the-art owned integrated consumer goods manufacturing and logistics facilities across regions in line with long-term demand forecasts. Currently, over 15 projects are underway and in various stages of development - from land acquisition/site development to construction of buildings and other infrastructure. In the Hotels Business, the construction of new hotels in Kolkata and Ahmedabad is progressing well. The major items of capital expenditure in the Paperboards, Paper and Packaging segment going forward comprise paperboards capacity augmentation/machine rebuild at the Bhadrachalam unit and capacity augmentation in Cartons and Flexibles packaging at the Tiruvottiyur and Haridwar unit. Overall, the Company estimates capex of around 19000 Crores over the next 5 years (excluding investments for inorganic growth and acquisition of trademarks, other intellectual property, etc.). However, this would depend on several factors such as pick-up in economic activity and improvement in demand conditions, timely acquisition of land at desirable locations, obtaining approvals from the concerned authorities in a timely manner etc. Q25. Why has the Segment Capital Employed decreased by Rs. 74 Crores from Rs. 23,909 Crores as at 30th September 2018 to 23,835 Crores as at 31st December 2018? Answer: The decrease in Segment Capital Employed was primarily on account of higher statutory liabilities and lower inventory. Q26. What are the dividend payout trends in recent years? What is the Dividend policy of the Company? Please refer to the following link for the Dividend Distribution policy of the Company. Q27. Please explain the Company's 'Triple Bottom Line' philosophy. Answer: Inspired by the opportunity to sub-serve larger national priorities, the Company redefined its Vision to not only reposition the organisation for extreme competitiveness but also make societal value creation the bedrock of its corporate strategy. This super-ordinate Vision spurred innovative strategies to address some of the most challenging societal issues including widespread poverty, unemployment and environmental degradation. The Company's sustainability strategy aims at creating significant value for the nation through superior 'Triple Bottom Line' performance that builds and enriches the country's economic, environmental and social capital. The sustainability strategy is premised on the belief that the transformational capacity of business can be very effectively leveraged to create significant societal value through a spirit of innovation and enterprise. The Company is today a global exemplar in sustainability. It is a matter of immense satisfaction that its models of sustainable development have led to the creation of sustainable livelihoods for around six million people, many of whom belong to the marginalised sections of society. The Company has also sustained its position of being the only Company in the world of comparable dimensions to have achieved the global environmental distinction of being water positive (for 16 years in a row), carbon positive (for 13 consecutive years) and solid waste recycling positive (for 11 years in succession). To contribute to the nation's efforts in combating climate change, the Company's strategy of adopting a low-carbon growth path is manifest in its growing renewable energy portfolio, establishment of green buildings, large-scale afforestation programme and achievement of international benchmarks in energy and water consumption. In FY 17-18, over 43% of the Company's total energy requirements were met from renewable energy sources - a creditable performance given its expanding manufacturing base. In addition, the practice of ensuring that premium luxury hotels, office complexes and factories of the Company are certified at the highest level by the US Green Building Council / Indian Green Building Council and the Bureau of Energy Efficiency (BEE) continues. The Company has adopted a comprehensive set of sustainability policies that are being implemented across the organisation in pursuit of its 'Triple Bottom Line' agenda. These policies are aimed at strengthening the mechanisms of engagement with key stakeholders, identification of material sustainability issues and progressively monitoring and mitigating the impacts along the value chain of each Business. The Company's 15th Sustainability Report, published during the year detailed the progress made across all dimensions of the 'Triple Bottom Line' for the year 2017-18. This report is in conformance with the latest Global Reporting Initiative (GRI) Guidelines - G4 under “In Accordance - Comprehensive” category and is third-party assured at the highest criteria of “reasonable assurance” as per International Standard on Assurance Engagements (ISAE) 3000. Please refer to the following link https://www.itcportal.com/sustainability/sustainability-report-2018/sustainability-report-2018.pdf for Sustainability Report 2018. In addition, the Business Responsibility Report (BRR), annexed to the Report and Accounts 2018, maps the sustainability performance of the Company against the reporting framework suggested by Securities and Exchange Board of India. The Company has voluntarily prepared its first Integrated Report for the financial year 2017-18. As a green initiative, the Report has been hosted on the Company's corporate website at https://www.itcportal.com/about-itc/shareholder-value/index.aspx. Q28. Please provide an update of the Company's Corporate Social Responsibility Programme. Answer: The Company's Social Investments Programme aims to address the challenges arising out of poverty, environmental degradation and climate change through a range of activities with the overarching objective of creating sustainable sources of livelihood for stakeholders.